Industrial Lift Tables and Pallet Positioners are used to lift material and position it at the proper height. They are very useful for machine feeding, assembly work, order picking, pallet loading, and a wide range of other jobs. 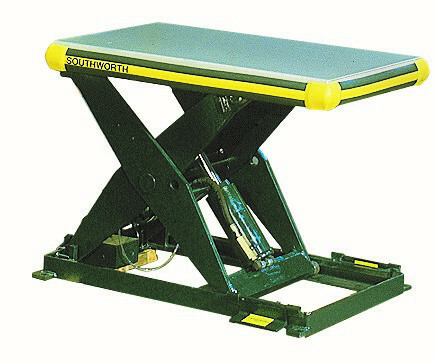 Industrial lift tables and pallet positioners come in many standard sizes and capacities. Cranston Material Handling of Pittsburgh can identify the proper lift or positioner for your application. Lifts and Positioners can be hydraulically or pneumatically powered and can include a turntable or tilting top. They are available in many top sizes, lifting heights, and capacities. Count on Cranston Material Handling of Pittsburgh, Pennsylvania. We have the experience to help you correctly identify the industrial lift table or pallet positioner that will allow your work to be accomplished faster, safer, and easier. Lift Tables vertically lift the load to the ideal working height. Low-profile tables sit essentially flush to the floor to allow for pallet jack loading. Turntable tops save time by allowing the worker to reposition the load rather than having to take the time to walk around the equipment or material. PalletPal level loaders keep the material at an ideal height for building or breaking down pallet loads. They use a simple system of springs to lower and raise the load, as boxes are added or removed from the pallet. The turntable top allows nearside loading and unloading. Elevating Work Platforms are for assembly or maintenance operations, where large pieces of equipment must be accessed at elevated or varying heights. They offer more flexibility and safety than scaffolding or ladders. Also they allow workers to access otherwise difficult to reach work areas. Powered lifting stackers are available with powered or manual drives. They are used to load racks, move loads throughout the plant, or position pallets for easy access in manual unloading and loading operations.